How can I disable the function "Edit Message" under Message, Actions, Other Actions? 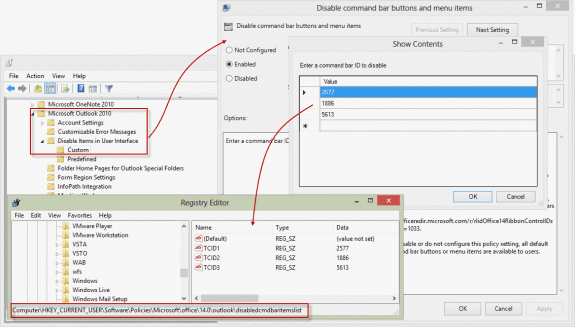 You can disable commands using group policy or by editing the registry. Group Policy is not limited to use by network administrators. Anyone can use it. The Control ID value is stored in TCIDn String values, where n is the order in which the command was entered. If you don't want to edit the registry, I have a ready-to-use registry file you can download and run. Right click on the link and choose Save target as (IE) or Save Link As (Firefox). Double click to run it and add the values to the registry. Below is a list of commonly disabled features or Control IDs I've previously looked up for one reason or another. Most of the Control IDs are the same in all versions of Outlook (that use that command). If you know the Control ID for a command in Outlook 2003, there is a very good chance it is also used for that same command in Outlook 2016. In many cases the Control ID applies to all methods of accessing the command. For example, disabling Import/Export on Outlook's File, Open menu also disables it in File, Options, Advanced. Keyboard shortcuts will usually still work; e.g. disabling the Delete button on the ribbon and right click menu does not block the Delete key. Unless otherwise stated, the following commands work on Outlook 2013/2016 and up. They may work with older versions when the same command exists. If you don't know the command's Control Name, filter for the Group name in the Group/Context Menu Name column of the Control spreadsheets. The following Command IDs remove the accept as tentative options and Do not send a response from meeting requests. Outlook 98 Command bar controls list This list is old, but the IDs don't usually change between versions. In most cases, the Control ID is the same across all versions of Outlook. Hy I want to to disable quick print from menu in the outlook 2013 but registry key or policy is complete ignored. If I search internet is not possible to remove quick print from outlook menu. I have chose ID 2521. If somebody done this please share how? Did you put it in HKEY_CURRENT_USER\Software\Policies\Microsoft\Office\15.0\Outlook\DisabledCmdBarItemsList ? Which suite do you use? Some policy keys won't work with the versions intended for Home use. Kindly help us to disable the Stationary and Fonts button completely in the outlook 2016 through Group policy. where we tried but it only disabling partially inside the Stationary and Fonts button few options are disabled. . This should be the code and should disable the options dialog - 3766. But some of the suites (ones targeted to consumers) don't support the policy key. I guess if it partially worked, then you don't have one of those versions. What features did it not disable that you want disabled? The commands, if supported, are activated by default. You only use group policy to disable the commands. Are you using an IMAP account? Categories are not supported in imap accounts and flags are limited to flag on, flag off. Thank you for explaining how to disable the Archive button. It caused a lot of "disappeared email" problems in our company. Unfortunately, the Backspace key also moves an email to Archive. Is there a way to disable this as well? No, not at this time. If they give us an option to actually disable the feature, then it will apply to the backspace key too. They are in the mailitem controls spreadsheet as RequestDeliveryReceipt (14364) and RequestReadReceipt (14365). Hello, I am trying to find the commandID to remove the Open Calendar -> From Address Book. I only want Open Calendar -> From Room list to be visible. Is this possible? Also in the calendar Section when Right Clicking on any calendar heading and Add calendar -> From Room List. I just want a set of users to have the ability view Rooms and nothing else. AFAIK, you can get this specific. Please tell me the «command bar ID» for.. whole «Menu Bar» of Office 2003. Sorry, I don't know the id for it - if you are trying to remove it, it can't be removed.